It started off with this photograph, taken during the war. There’s a street in the City of London called Walbrook which was heavily bombed. After the site had been cleared, ready to build a new office building, there was an excavation that turned up – on the very last day of the dig – the head of a goddess. It was realised that this was the site of the most mysterious Roman god, Mithras. His temple had been constructed here, and worship was centred around sacred bulls, which may have been sacrificed there. There had been artefacts found around here over a long period – among the sculptures the archaeologists found was a head of the god himself, recognisable by his Phrygian cap. As often happens in these cases, the temple was saved for the nation and reassembled but there was no clear idea of what to do with it. It had been built on the Walbrook, then a river, to supply it with fresh water. Now, it has found its place. 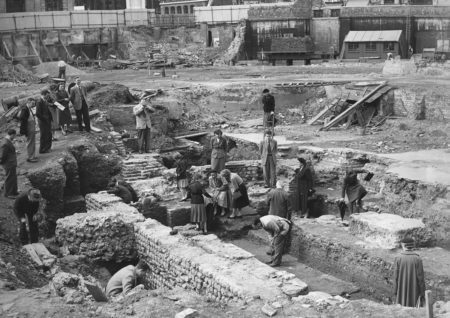 The ruins have been reconstructed as they appeared at the end of the excavation in October 1954, reflecting the first building phase of around AD 240. They can be seen in the basement of the Bloomberg building, which offers free entry but you must book a visit in advance. Inevitably it’s smaller than expected but still fascinating. 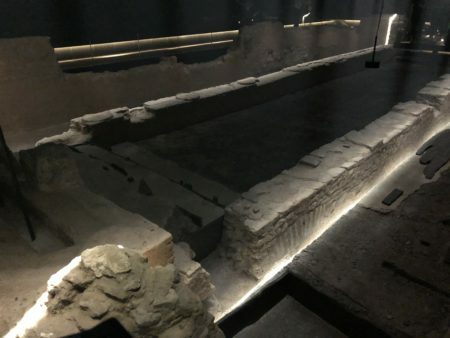 There are three floors going deep underground, the first displaying artefacts found on the site like jewellery and sandals, then there’s an audio-visual presentation and finally the temple remains themselves, arranged in a son-et-lumiere presentation. Walbrook is an interesting street. 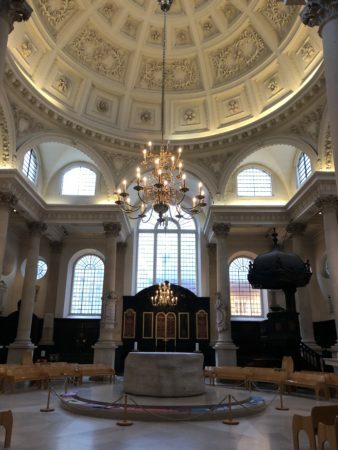 It houses the often overlooked St Stephen Walbrook, a graceful circular church with a grand dome, one of one hundred churches in the City of London. It always strikes me as odd that in the City, where there’s so much more to see, there are so few tourists. 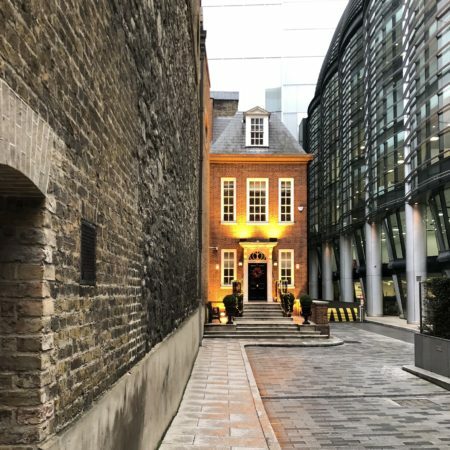 Next to the church is there Walbrook Club, a throwback members club for atavistic company directors who like their women in skirts and their grouse shot personally. Pretty mock-Queen Anne building, though. There’s odd art here in there shape of bronze tree roots cascaded with water. 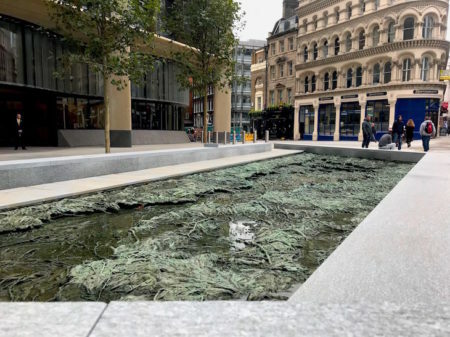 London was probably founded on the spot two millennia ago, and the Romans built their city on the hills of Ludgate and Cornhill, which are separated by the valley of the Walbrook. That river still flows under the site as part of the sewer system. The trio of sculptural fountains are by Spanish artist Cristina Iglesias, and remind us that the city grew from the river that lies beneath. On my way back I take a stroll through Covent Garden, heading for lunch at the delightful English restaurant Cora Pearl, and find each of the wards decorated in different Christmas styles. Monmouth Street’s decorations run up to Seven Dials, while down in the market giant reindeer predominate. 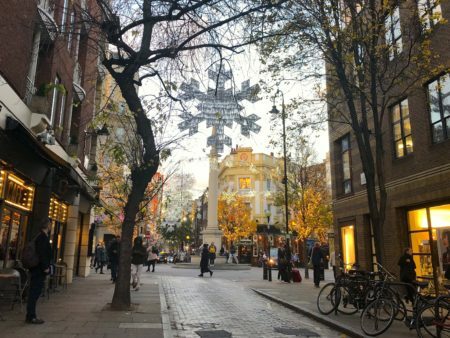 London gets very sparkly around about now, with each ward seeking to outdo the next.. It’s worth wandering into the side streets to take a look, especially since Leicester Square is the spot to avoid at this time of the year. have you checked out Ben AAronovitch’s latest? It concerns the Temple of Mithras. I wonder if Nigel Kneale saw that photograph after BBC Producer Rudolph Cartier said to him, in about 1958: “Let’s have another Quatermass!” The site does, if you are familiar with the 1959 BBC Serial, ‘Quatermass And The Pit’ (available on BBC i-player, and simply excellent), look just like the Hobbs Lane site. In the nineties I used to have an office at 72 Cannon Street, almost directly opposite Walbrook, and often parked my car in the underground car park in the basement of the office building that was built over the site of the Mithraeum. I also had a friend who was at that time researching her PhD on “Mithras and the cult of Sol Invictus” so I was very aware of the significance of the site. Some of the rituals of Mithraism involve going down into an underground corridor in the temple and emerging ‘reborn’. It gave a whole new feeling to walking down into the dark to collect my car. Kipling did a nice bit about Mithras in Puck of Pook’s hill. I set a tune to the Legion’s Marching Song (about Lalage) and used to sing it to myself when I was walking home from the school bus. The Mithras cult was popular with the Roman army and small wonder with its orderliness and mutual support. No place for women I understand, but there wan’t in the army, either. It’s found all across the Roman empire. Ian Mason, did your friend publish the thesis on Mithras and Sol Invictus? That might be interesting to read, even if written in academese. I’d forgotten all about Puck of Pook’s Hill – must reread it. The Quatermass connection is interesting – it must have been on people’s minds. I like Ben Aaronovitch but don’t really enjoy supernatural books much these days. Too old and cynical. Oh Rachel, you beat me to it. I have just finished that today. Loved it. Not for the supernaturals of it, but the wonderful humour and the information about London. And to be fair it is difficult to include a good history of London without touching on the many beliefs of the many different peoples that have occupied the space. I’m in Colchester which has a similar problem; being the capital whilst London was still a “bridge with a shanty town attached to it”. While women couldn’t be fighting Roman soldiers, women were certainly part of the Roman army’s vast traveling impedimenta, according to my Latin instructor, who I believe knew Julius Caesar. There’s a mystery series featuring a follower of Mithrus, who is Lord Chamberlain to a Boris Johnson-like Justinian 1. Nice reading–sorry can’t remember author. ‘Puck Of Pook’s Hill’ was based on the landscape that Kipling could see from his home, Batemans, in Sussex. Kipling was well aware of local folklore, and of one place near his home, called ‘Gladwish Wood’, near Burwash. Kipling referred to it as being ” Full of a sense of ancient ferocity and evil.” His biographer (and ghost hunter), R.Thurston Hopkins visited the wood with a party of people to see if they could encounter the ghost of murderer David Leaney, who was hanged in the wood. They did. And Hopkins wished he hadn’t. His description of it, when he actually blundered into it, thinking it to be one of his friends, is simply terrifying. He went back some weeks later, and a friend of his got lost in the wood, and encountered a spindly, skeletal thing that staggered through the undergrowth, moaning and coughing, and plucking at it’s ragged throat. The terrified man struck it on the head with his stick, caving it’s head in, and causing it to crumble to the floor. It was reported to still be blundering about in the dark wood many years later. Not rising to that one, no not at all. Wonderful. I used to walk all over London and that shot of the Walbrook is magical, and one that I would never have been able to place. Something entirely new to me. Though I fear so much of London would be new to me now. This would make a great chapter for ‘Arthur Bryant’s London Walks’ edited by Mr C. Fowler. The Arthur Bryant Scarf – six feet long and available in dusty green, tobacco brown, and a colour we haven’t got a name for yet. Are The Sights Of London Being Compromised?